In Scaling Up Excellence, bestselling author Robert Sutton and Stanford colleague Huggy Rao tackle a challenge that determines every organization’s success: scaling up farther, faster, and more effectively as a program or an organization creates a larger footprint. Sutton and Rao have devoted much of the last decade to uncovering what it takes to build and uncover pockets of exemplary performance, to help spread them, and to keep recharging organizations with ever better work practices. 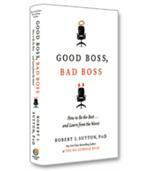 Most companies have "pockets of excellence," according to Stanford University professors Robert Sutton and Huggy Rao -- units, departments or subsidiaries where people perform at the highest levels and generate the best results in the organization. The problem that bedevils many leaders, however, is how to spread that excellence throughout the company -- what is known to practitioners as "scaling" or "scaling up." 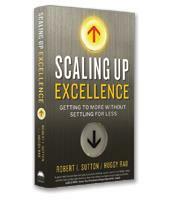 In their new book, Scaling Up Excellence, Sutton and Rao describe five principles required to scale up the excellence. 1. Hot Causes, Cool Solutions. This first principle involves the debate on what comes first: changing the mindset and beliefs of the people in the organization (hot causes) or making people change their behaviors whether they believe in the cause or not. The authors argue that either order can work. 2. Cut the Cognitive Load. Scaling up requires new actions, new processes and new learnings, and sometimes employees can get overwhelmed by all that is new. The authors recommend that organizations that are scaling up look not only to "add" but to "subtract" as well. Limit the bureaucracy whenever possible. Find the old processes or old structures that are no longer needed in the new scaled-up organization. 3. The People Who Propel Scaling. "People propel scaling," as the authors put it, and that first means having the right people with the right skills doing the right things. Hiring the right people, however, is just the beginning. No matter how talented your employees, scaling up doesn't work unless they are accountable: that is, they are compelled to work in the organization's best interest. 4. Connect People and Cascade Excellence. Connecting people is also key to spreading the excellence. Diversity plays a role: The more departments, functions, locations and positions on the organization's ladder are represented, the greater the reach of the scaling-up effort. 5. Bad Is Stronger Than Good. Because they will have much more impact than any positive actions, it is essential to prevent and eliminate any and all destructive attitudes, beliefs and behaviors from the organization, according to the authors. Lesson number one: Nip it in the bud. 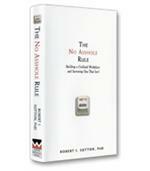 Each of the principles are supported and illustrated through a variety of case studies and academic research. In addition, the authors offer a specific and detailed list of practical how-tos to instill the principles in an organization. For example, among the seven ways to ensure the talent and accountability required for successful scaling up (principle three) are squelching free riders and bringing in guilt-prone leaders -- those who will feel guilty for putting their needs above the needs of those they lead. One of the key questions that leaders of scaling-up initiatives will need to ask themselves is whether or not one size fits all. The authors call this the Catholicism (replicating tried-and-true practices throughout the organization) vs. Buddhism (having a guiding mindset but adapting the practices to fit local conditions). There is no right or wrong answer. Leaders, however, will need to figure out which path is best as they launch their initiatives. Based on what they call a "seven-year conversation" that included combing through hundreds of academic studies, conducting detailed case studies as well as targeted interviews, and presenting emerging ideas to a wide range of business audiences, Scaling Up Excellence is a definitive guide on one of the key paths to organizational success.